You can scroll through the worksheet using the horizontal and the vertical scroll bars which can be found at the bottom and the right side respectively. 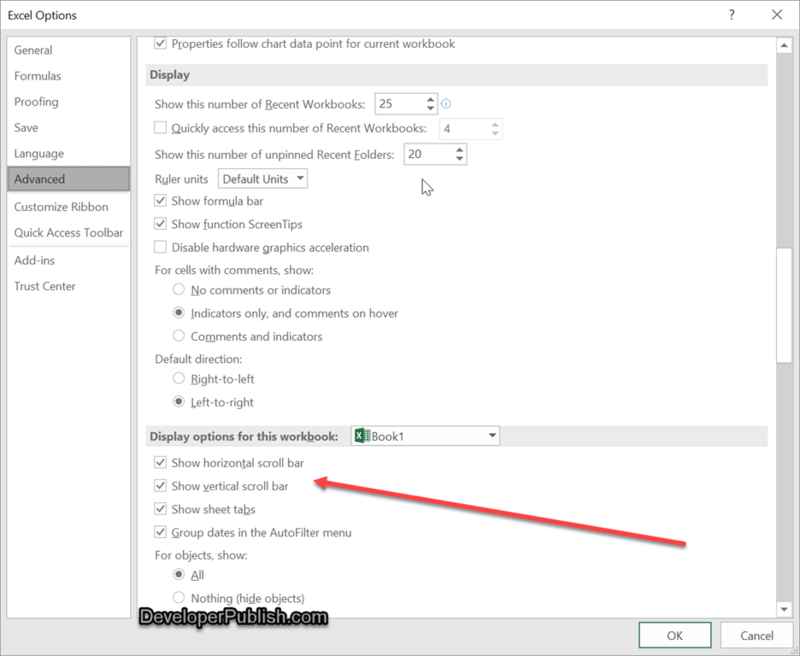 Here’s a simple tips demonstrating how you can turn show or hide the scroll bars in Microsoft Excel 2016 using Excel Options Dialog. How to show or hide Vertical and Horizontal Scroll bar in Microsoft Excel 2016 ? 1. Click File from the Ribbon and select “Excel Options”. 2. In the Excel Options dialog , select “Advanced” category from the left sidebar. and scroll down to the “Display options for this workbook” section and uncheck the options “Show horizontal scroll bar” and “Show vertical scroll bar” to turn off the scroll bars and then click the OK button. To turn on the scroll bars back , follow the above steps and then enable both of the options.